Kids (and adults) love stories that begin on the cover of the book. 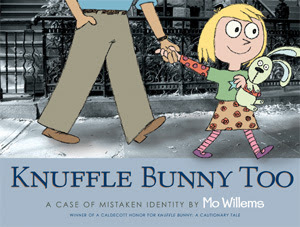 Starting this sequel with wordplay for "too", Knuffle Bunny Too, A Case of Mistaken Identity, by Mo Willems, finds our heroine Trixie back with her one-of-a-kind Knuffle Bunny sidekick beginning a new adventure - SCHOOL! Unfortunately, even as her daddy kisses her goodbye and leaves her in her new classroom, Trixie is shocked to find that her Knuffle Bunny is not so one-of-a-kind after all. Sonja also has one. The situation goes downhill from there until Ms. Greengrove, their teacher, takes both bunnies away for a time out because the two girls are arguing. Now all the pieces are in place for the accidental "switch" that leads to the case of mistaken identity. Willem's clever use of illustration and photography, his ability to capture the unspoken conversation between Trixie's parents in a couple of glances, the pain of separation between Trixie and her Knuffle Bunny, and the pure joy and importance of a middle-of-the-night rendevous make this a must read. Not only is this title a finalist for the Cybil's picture books award, but Mo had this to say about us "wacky bloggers". The Cybils' Awards have even attracted the notice of the International Reading Associaton in particular for Knuffle Bunny Too. 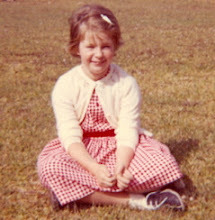 Check out Mother Reader's review here. Finalists will be announced on February 14th.